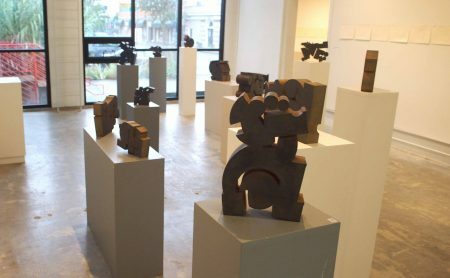 Relation, an exhibition of Stuart Fink’s intense and intricate sculpture, fills the two relatively small exhibition rooms at Brazee Gallery in Oakley with ease and assurance. It’s almost as though they’ve been there before and in a sense they have, although not these particular pieces. They have a famial relationship to earlier work Fink has shown here, but his work is always evolving. 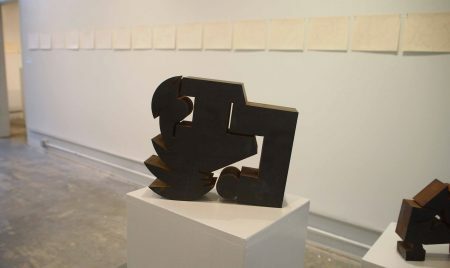 For this exhibition he thanks a recent collaboration with Thomas J. Mackessy of Ometek Inc., a water-jet cut metal fabricator, which apparently allowed him new approaches to the shaping of form. 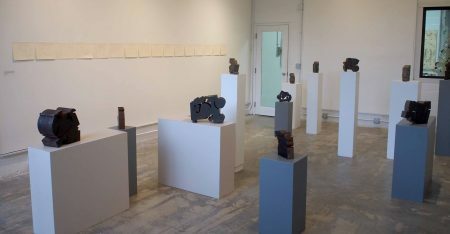 A total of twenty-eight sculptures are presented, an easy number to recognize as there are no individual names for these intricately planned variations on a theme, only numbers. 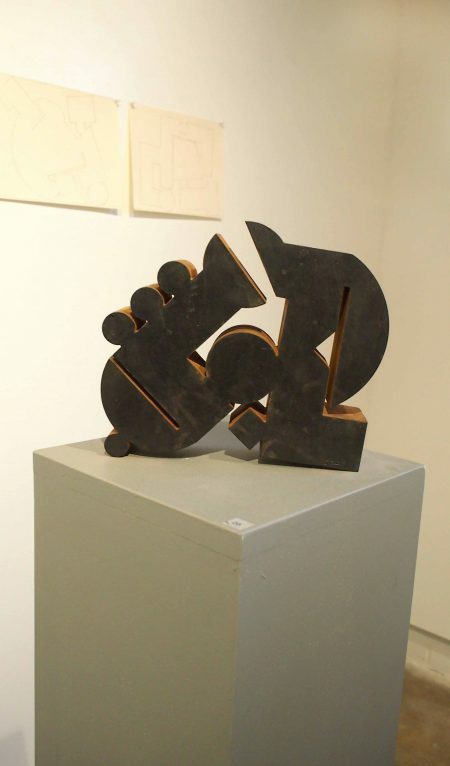 Fink is a teaser, though: to begin with, the pieces themselves look to be made of wood, but they are rust-toned metal. You expect movement, somehow, from these curled and thrusting components but it doesn’t happen. There are tricky variations: Number 5, for instance, has curved, lip-like extensions that are squared off in other works. 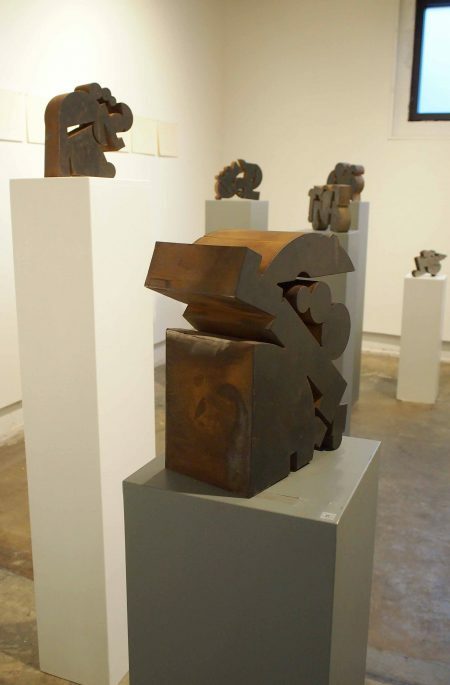 He has said he is constantly exploring intersections of line, shape, movement and balance. I think the individual pieces are most effectively viewed from the side. Two flat areas are opposite each other, forming what I take to be front/back but perhaps that’s too easy. Looking at the other two sides, however, is where the fun starts so that’s why I see them as front/back. The works are under a foot in height and would fit into a foot square box. Within that relatively limited area a lot is going on. Rounded segments are echoed by curved space; space is as important as tangible elements here. The flat sides are darker than the interior surfaces, which gives shape to that interior action. The materials have almost certainly had earlier uses; at least one work has remnants of numbers from its previous life still present on its surface. Drawings for these sculptures line the sides of each of the two galleries and are essentially complete in themselves. They are individually for sale as well as the sculptures; ideally, ownership should be of a drawing and a piece relating to it, but either one rewards study. 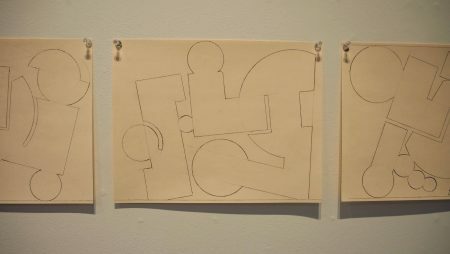 Fink’s work is concerned with that tricky element, balance, as well as repeating shapes in a way that suggests but doesn’t determine a specific thing. In other words, he’s out to catch us off guard and give us a challenge. Three dimensions has proved to be a comfortable place for an artist whose vision has been, in many ways, always cued to multiple interactions. He doesn’t intend for his works to be playful. “They are aggressive” he told me once, an aggression I see as both stylized and effective. He can work with a particular challenge again and again, exploring its ins and outs with endless new approaches. So this exhibition, like others Fink has had, presents a series of closely connected works with individual variations that never stop. 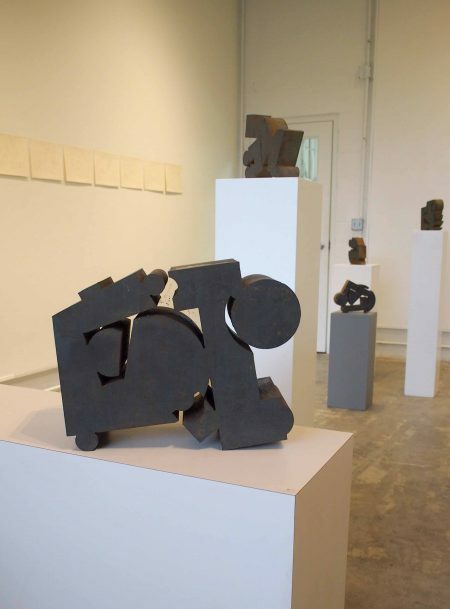 The exhibition is on view at Brazee Gallery, 4426 Brazee Street in Oakley, now through October 5, where the hours are quirky enough to require specific mention: Tuesday, 9 a.m. to 7 p.m.; Thursday, 9 a.m. to 8 p.m.; Friday, 9 a.m. to 5 p.m.; Saturday, 10 a.m. to 5 p.m. Closed Sunday, Monday and Wednesday.